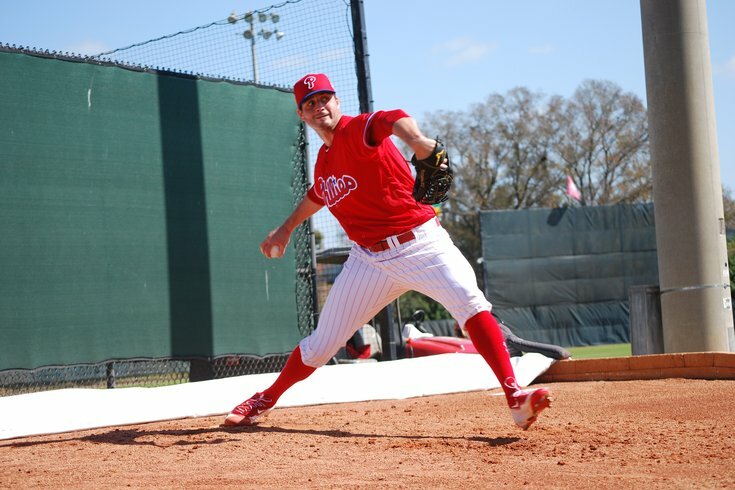 Mark Appel's first season in the Phillies system was limited to eight starts. He underwent surgery last June to have bone spurs removed from his right elbow. CLEARWATER, Fla. – The luster has long worn off Mark Appel’s status as a top tier prospect. The former No.1 overall pick (and a two-time top-10 pick) of the 2013 draft didn’t appear on any top 100 lists this winter. Coupled with his early summer elbow surgery last year, his minor league numbers in the last four seasons haven’t merited a mention among the elite young players hoping to put their stamp on a big league roster in 2017. But Appel, optioned to minor league camp on Tuesday morning in Clearwater, Fla., is confident that his time with the Phillies will arrive in the coming months. Baseball is a results-oriented business and Appel more than anyone realizes that fact. Like Aaron Nola, he was drafted with a near-Major League ready label and came up through a prospect-rich Houston Astros farm system where rising minor pitchers were regularly jockeying for big league jobs. Appel reached Double-A in July of 2014, one calendar year since the Astros drafted him with the top pick, but never found enough consistency to warrant a promotion to the major leagues. He’s back with a prospect-rich farm system. The Phillies’ greatest strength may be near-MLB ready pitching depth, with Zach Eflin, Jake Thompson, Ben Lively, Nick Pivetta, Ricardo Pinto, and left-hander Elniery Garcia (the latter three were also sent to minor league camp in the last few days) all bidding to be the first man up when the major league rotation has an opening in the coming months. So what’s Appel’s confidence level that he’ll be that guy? A year ago, Tommy Joseph was a few months removed from being taken off the MLB roster, available to any team that wanted him in the Rule 5 Draft, and banished to minor league camp before big league camp opened when he took advantage of being healthy and began turning heads at the Carpenter Complex. He parlayed that into a productive first month at Triple-A Lehigh Valley and earned his way to his first big league call-up. Appel, who has a 4.47 ERA and 1.98 K/BB rate in 20 career starts at Triple-A, is healthy now, too. If he can replicate Joseph’s spring of 2016 and get off to a strong start with the IronPigs, he may realize his potential yet. But Appel had a mixed bag of results in major league camp. He allowed at least one earned run in each of his four appearances while striking out eight and walking four in nine innings. He understands commanding his pitches is the most important skill set he has to master in order to get on the Phillies’ radar. But after all that he’s been through, and nearly four years since he went first overall to the Astros, isn’t he antsy for that big league phone call? Appel was added to the 40-man roster this fall. He turns 26 in July. In short: it’s put-up or shut-up time. When asked if he had picked the brain of any of the guest instructors at camp – from Roy Halladay to Larry Andersen, Brad Lidge and Chad Durbin – Appel said he’s bonded in each of the last two springs with Andersen, the owner of a filthy slider that gave him 17 seasons in the major leagues and a wit that’s served him well as a broadcaster in the last 20 years. Perhaps something he gleaned from L.A. will serve Appel well in the coming months.